Why Buy a New Vehicle at Lynch Toyota? Wants vs. needs. How about both? Under the hood, its efficient 2.0L Dynamic Force Engine punches up your adrenaline the moment you shift into Drive. And you can hone your paddle-shifting skills with our Dynamic Shift-CVT, which combines the immediate response of a traditional First gear with the efficiency of a Continuously Variable Transmission (CVT). An all-new platform helps you bring even more excitement around every corner. 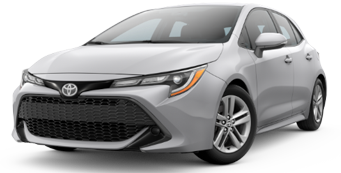 Corolla Hatchback is close to the ground, keeping its center of gravity low for improved responsiveness and stability in the turns. 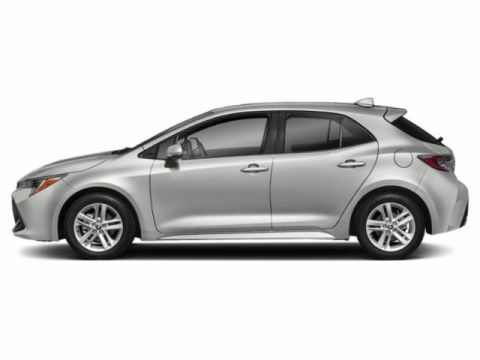 Its all-new suspension helps reduce body roll, keeping this Hatchback planted when things get twisty, all while smoothing out the bumps of the everyday drive. Corolla Hatchback’s leather-trimmed sport seats feature deeply contoured bolsters to help keep you in place when the roads get exciting. And with their available two-stage heating, these seats give you year-round comfort. Three pedals. Six forward gears. One incredible driving experience. 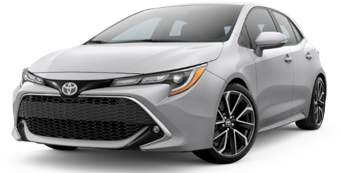 Corolla Hatchback’s available 6-speed Intelligent Manual Transmission (iMT) features close-ratio gears down low for spirited acceleration, with taller gears up top for optimized fuel economy while cruising. It also incorporates an intelligent rev-matching feature, helping reduce transmission shock when downshifting. Corolla Hatchback’s lighter, wider stance will inspire more rpm from A to B. Its practical Hatchback design is underlined with a rear glossy hatch and highlighted with its chrome tailpipe diffusers. An available, refined chrome grille surround drives attention to Corolla Hatchback’s all-new design. Corolla Hatchback refuses to hide in the dark. Standard LED taillights light up the night for a distinctive, captivating look. Available 18-in. alloy wheels add to the unique profile of Corolla Hatchback. Every stoplight is a chance to make a new impression. Every spoke on the wheels is crafted to enhance style and performance. The premium piano-black accents, soft-touch materials and contrast stitching on the dash and doors match the artistry under the hood. Corolla Hatchback features a stunning 8-in. Multimedia touch-screen command center. Its standard Entune™ 3.01 Audio system puts your favorite options at your fingertips with a customizable homepage and App Suite2 with available Entune™ 3.01 Toyota Connected Services. And with features like standard Apple CarPlay™3 support, Scout® GPS Link4 compatibility and the available 8-speaker, 800-watt JBL®4 speaker system, you’ll find even more reasons to take the long way home. 2Apple CarPlay® is a registered trademark of Apple Inc. Apps and services subject to change at any time without notice. 3The Scout® GPS Link App is available only in Toyota vehicles equipped with Entune™ Premium systems. Once downloaded, the Scout® GPS Link App three-year trial begins upon your first connection with Entune® App Suite after you have synced with the Scout® GPS Link App with your Bluetooth®-enabled phone availability and accuracy of the information provided by Scout® GPS Link is dependent upon many factors. Use common sense when relying on information provided. Services and programming subject to change. Services not available in every city or roadway. Subscription required after end of three-year complimentary service. See toyota.com/entune for details. Scout® is a registered trademark of Telenav, Inc.
4JBL® is a registered trademarks of Harman International Industries, Incorporated. This driver-centric cabin doesn’t settle on comfort. With just the press of a button, the available heated seats will get toasty in no time so you can stop worrying about the cold and start enjoying every turn. An available 7-in. Multi-Information Display (MID) helps you stay focused around every turn by bringing driving information right before your eyes. And you can keep your hands on the steering wheel while scrolling through playlists, making phone calls5 & 6 and more with Corolla Hatchback’s advanced steering wheel controls. 5The Bluetooth® word mark and logos are registered trademarks owned by Bluetooth SIG, Inc. and any use of such marks by Toyota is under license. A compatible Bluetooth®-enabled phone must first be paired. Phone performance depends on software, coverage and carrier. 6Concentrating on the road should always be your first priority while driving. Do not use the hands-free phone system if it will distract you. You like it cool. Your passenger likes it warm. And with Corolla Hatchback’s available dual zone automatic climate control, you can both ride in total comfort. Don’t waste time fumbling for your keys. Corolla Hatchback comes standard with the Smart Key System7, which lets you unlock the doors and trunk, plsu start the engine, with just the push of a button -- all while the key fob sits comfortably in your pocket or bag. 7The Smart Key System may interfere with some pacemakers or cardiac defibrillators. If you have one of these medical devices, please talk to your doctor to see if you should deactivate this system. By illuminating a warning signal on the applicable outside mirror, the available Blind Spot Monitor (BSM)8 is designed to alert you to vehicles that may be hiding in Corolla Hatchback’s blind spot. 8Do not rely exclusively on the Blind Spot Monitor. Always look over your shoulder and use your turn signal. There are limitations to the function, detection and range of the monitor. See Owner’s Manual for additional limitations and details. Corolla Hatchback’s standard backup camera9 helps you back up with confidence, so you can easily get in and out of that parking spot. 9The backup camera does not provide a comprehensive view of the rear area of the vehicle. You should also look around outside your vehicle and use your mirrors to confirm rearward clearance. Environmental conditions may limit effectiveness and view may become obscured. See Owner’s Manual for additional limitations and details. Every new Corolla Hatchback is built with our Star Safety System™, an advanced integration of active safety technologies designed to enhance traction, braking and more. Armed with these active safety features, Corolla Hatchback helps you avoid accidents in the first place. Not every car provides this level of safety, just every Toyota. Located behind the grille-mounted Toyota badge is a millimeter-wave radar that can help detect vehicles, pedestrians and bicyclists that may be in your driving path. 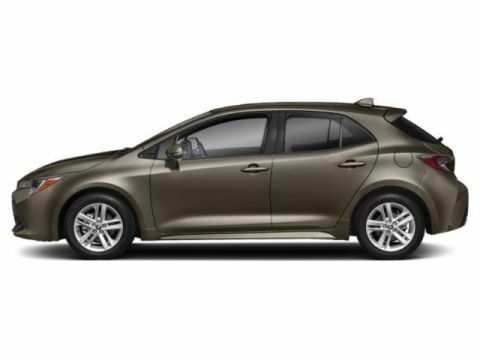 Should the radar detect something, it communicates with the in-vehicle camera to determine what the object might be, and if needed, how the Toyota Safety Sense™ 2.0 (TSS 2.0)10 system should react. This in-vehicle camera can also detect some road signs, making it a key component of TSS 2.0’s Road Sign Assist (RSA)11 feature. 10Drivers are responsible for their own safe driving. Always pay attention to your surroundings and drive safely. System effectiveness is dependent on many factors including road, weather and vehicle conditions. See Owner’s Manual for additional limitations and details. 11Do not rely exclusively on Road Sign Assist (RSA). RSA is a driver support system that utilizes the vehicle's forward-facing camera and navigation system to recognize certain road signs and provide information to the driver via the multi-information display and/or Head-Up Display. Effectiveness is dependent on road, weather, vehicle and sign conditions. Use common sense when using RSA and do not drive distracted. See Owner’s Manual for additional limitations and details. 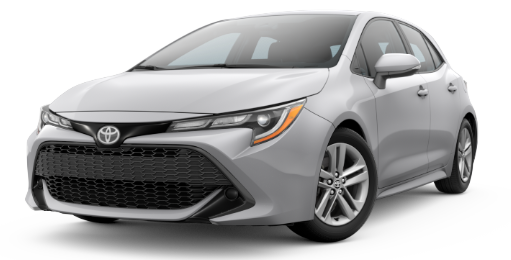 12019 Corolla Hatchback XSE with automatic transmission preliminary 30 city/38 hwy/33 combined mpg estimates determined by Toyota. EPA ratings not available at time of posting. Actual mileage will vary.